Written by BREC on 11 September 2012 . I'm happy to present my newest listing below. Click the "View Details" button to see the complete listing information. If you're interested in learning more or seeing this property, please contact me. Real Estate Investors - The key to turning the market around? Written by BREC on 24 August 2012 . Based on these criteria, a real estate agent or broker should be able to work with a core group of long-term, seasoned, local investors who act as a stabilizing force on the market. In fact, many of the problems responsible for the collapse of the real estate market elsewhere -- rampant speculation, easy access to credit, lack of financial oversight and a boom-to-bust mentality -- are not as prevalent in the Dallas-Fort Worth area. Apply these factors to other cities, and you will quickly know the relative health of the real estate market in your city. For sellers, this means that realistic exit strategies from otherwise tough situations continue to exist. For neighboring homeowners, this improves the likelihood of price recovery -- thanks in part to the liquidity and property improvement enabled by the financial community. Compare this approach to the dynamics in Southern California or Las Vegas. Rapidly increasing prices bring speculators and even less scrupulous actors to a market where the situation devolves into "buy/fix/flip." The mentality is to get in and out quickly, before the bubble bursts. As prices rise, there are no cash flow investors -- rental rates are inconsistent with property values, and renting becomes only a way to minimize loss while holding a property for more price appreciation. The ability to accurately evaluate property becomes difficult as traditional valuation techniques break down. Inevitably, inexperienced buyers and out-of-area money enter the market. Investors not familiar with the street-by-street, neighborhood-by-neighborhood variables of an area become more prevalent, and an already difficult situation worsens. In this win-lose scenario, many people lose money, and sellers are left with few or no options. After the market crashes and bottoms, speculators come back into the picture and the cycle repeats itself. One lesson we can learn from Dallas and apply to other locales, which is different than Los Angeles or Las Vegas or Phoenix (another city undergoing a severe bust), involves the type of investor who enters the marketplace. This point is significant because, when I counsel sellers and review market data, properties must meet certain criteria. Listings need to satisfy the interests of seasoned experts who know how to deal with the reality of a challenging environment. For example, a purely speculative investor who relies more on emotion than analysis may not know the history of a neighborhood, the strength of the rental market, or the repairs needed to transform a neglected home into a profitable investment. Remember, distressed homes in a distressed marketplace require a radically different mindset than the outlook for a traditionally functioning real estate market. The surest way to understand pricing in a distressed marketplace is to invest capital and take a risk position on a property -- this is the unique perspective that a veteran real estate agent, broker or investor offers. Which means you must analyze the evaluation of properties on both a "market comparable" basis, and also as a long-term cash flow investment. In higher-priced and more speculative markets, a different approach applies. The renewal of distressed properties is a win for everyone. By turning these homes around, and through our efforts on the ground, neighborhoods improve and price stability returns. Equally important, recycling these distressed properties into quality retail homes (and clean rentals) aids those owners who are currently underwater on their mortgages. Experienced local investors who have a stake in the long-term economic viability of a community are completely aligned with the interests of homeowners. That's a recipe for success. Charles E. "Chas" Carrier is a principal of We Buy Ugly Houses Dallas, a HomeVestors of America Inc. franchisee. Written by BREC on 20 August 2012 . Your home is worth what a buyer will pay for it given current market conditions. This may not be the same as your opinion of what your home will sell for, or what you hope it's worth. Relying on emotion rather than logic when selecting a list price can lead to disappointing results.Homebuyers usually have a better grasp of current market value in the area where they're looking to buy than do sellers who own and live there. Buyers look at a lot of new listings. They make offers, know what sells quickly and for how much, and what doesn't and why. HomeGain reported that homebuyers still think sellers are overpricing their homes. The prime opportunity for selling a home is when it's new on the market. This is when it is most marketable. Buyers wait for the new listings. Usually, listings receive the most showings and have the busiest open houses during the first couple of weeks they are on the market. This is the opportunity to show your house off to advantage with a list price that attracts buyers' attention. Listings that sell today are priced right for the market. Buyers need to feel comfortable that they are getting a good deal. Buyers won't overpay if they feel home prices are still declining, and in some areas of the country, they still are. In areas of strong sales, buyers may shy away from multiple-offer situations if they feel the recovery is fragile and that prices may slide further before stabilizing. Even in areas where home sales have been strong in the first half of 2012, local practitioners wonder how long the uptick will last. They analyze these comparable sales giving more value to your home for attributes that it has that the comparables don't, like a remodeled kitchen. Value is subtracted from your home for features it lacks when compared to the sold comparables, like an easily accessible, level backyard. It's difficult for sellers to step back and take an attitude of detached interest in their home. But it's essential to do so if you want to sell successfully in this market. For example, your home could actually sell for less, not more, than a comparable sale because you added a swimming pool in an area where most homebuyers would rather have a yard with a generous lawn. If the comparable sale information suggests that the value of homes like yours is declining, select a list price that undercuts the competition to drive buyers -- and hopefully offers -- to your home. You can take a more aggressive stance on pricing if the comparables show that prices are moving up. If there is high demand for homes like yours, you may receive more than one offer. But don't list too high. It's better to stay in the range shown by the comparables and expose the house to the market before accepting offers. The market will drive the price up if it's warranted. Written by BREC on 13 August 2012 . 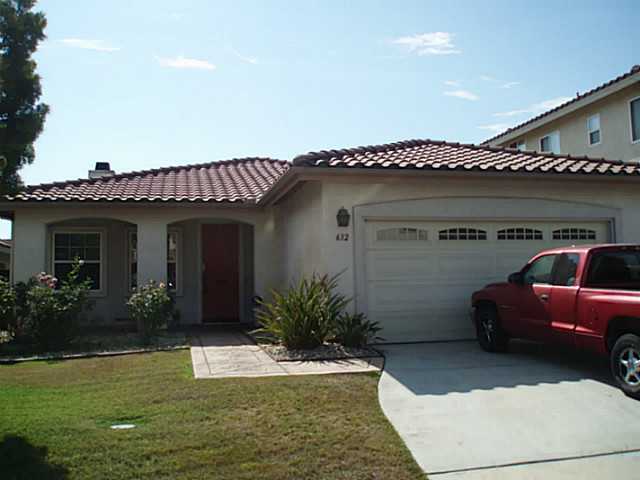 Beautiful and meticulously maintained Chula Vista home with easy access to I-805 and Sharp Hospital! Laminate floors in the main areas with diagonal cut tiles in the kitchen! Exquisite kitchen has recessed lighting and is adorned with Corian counter tops and plantation shutters; overlooking the perennial-green synthetic turf back yard and Trek deck! Home is wired for surround sound! Master bedroom has a huge walk-in closet and a garden tub in the bathroom!